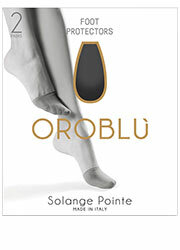 These Oroblu Pointe Toe Covers come in a 2 pair pack so they are great value as well as really useful. They help prevent rubbing when you want to go bare legged but need to wear closed toe shoes. They absorb moisture and are comfortable to wear. They could even pro-long the life of your tights when worn together. Rating: 5 It is a good website so easy to order and were delivered very quickly. Rating: 3 Unfortunately the Toe Covers don't have an extended sole which would prevent them from slipping off. All together better then none... I used to buy Toe Covers at Primark but they are not available any more. The covers (please note for future reference) had a padded little sole. Rating: 4 I have never used these before and wondered what they would be like. I use them for the same purpose as the Levante - i.e. that my big toe goes through tights very quickly. I might order these again. May be when I am used to them, I might prefer them! Rating: 4 Great. They do what they say and should save the toes of my stockings from my nails!! Rating: 5 The product was as I hoped, good quality and a good price, these toe covers are quite difficult to find, extremely good for those of us that always seem to get blisters on toes in new shoes or boots. Extremely light weight, but do the job.